Clinton: Israel "Needs to do Much More"
Secretary of State Hillary Rodham Clinton again praised Israel's offer to restrict its building of settlements in Palestinian areas, but said Monday that it falls well short of the U.S. desire for a full halt to building. Clinton spoke to reporters as she sat down for a meeting with her Moroccan counterpart in the North African country's capital. She was asked about negative Arab reaction to comments she made Saturday in Jerusalem that were widely interpreted as a softening of the U.S. position on Israeli settlement activity. CBS News State Department correspondent Charles Wolfson reports that Clinton said Israel had put some limitations on itself which, if acted upon, would be "unprecedented." Clinton said her approach is to offer what she called "positive reinforcement" whenever either the Israelis or the Palestinians make a move that the U.S. sees as a step forward in the peace process. CBS News correspondent Robert Berger in Jerusalem reports that after Clinton's failed attempt to restart talks between the Israelis and Palestinians over the weekend, the Obama administration has decided to extend the visit of its top envoy to the region. President Obama's special Middle East envoy George Mitchell will remain in the region to try and bring the parties back to the negotiating table. During a photo-taking session with her Moroccan counterpart, Clinton was asked by a reporter about the Arab reaction, and she responded by reading from a written statement that appeared designed to counter the skepticism about the Obama administration's views on settlements. "Successive American administrations of both parties have opposed Israel's settlement policy," she said. "That is absolutely a fact, and the Obama administration's position on settlements is clear, unequivocal and it has not changed. As the president has said on many occasions, the United States does not accept the legitimacy of continued Israeli settlements." She also called on the Israelis to do more to improve "movement and access" for Palestinians and on Israeli security arrangements. She added, however, that Israel deserved praise for moving in the right direction. "This offer falls short of what we would characterize as our position or what our preference would be," she added. "But if it is acted upon it will be an unprecedented restriction on settlements and would have a significant and meaningful effect on restraining their growth." 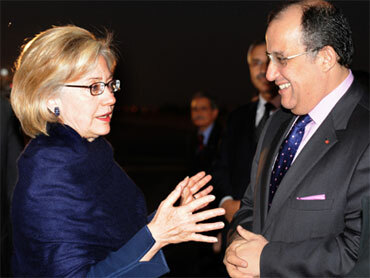 Clinton was flying later Monday to the southern-central city of Ouarzazate for an audience with King Mohammed VI. Later she was returning to Marrakech for talks with foreign ministers of several Persian Gulf nations. Clinton also was expected to meet separately with Saudi Foreign Minister Prince Saud al-Faisal, who has rejected U.S. appeals for improved Arab relations with Israel as a way to help restart Middle East peace talks, saying the Jewish state is not interested in a deal. After taking office in January, President Barack Obama buoyed Palestinian hopes for progress toward establishing a Palestinian state with his outreach to the Muslim world and an initially tough stance urging a full freeze to all settlement construction. But after making little headway with the Israelis in recent months, Clinton urged Palestinian leader Mahmoud Abbas in a face-to-face meeting in Abu Dhabi on Saturday to renew talks, which broke down late last year, without conditions. Abbas said no, insisting that Israel first halt all settlement activity in the West Bank and east Jerusalem - lands the Palestinians claim for a future state. Then, at a joint news conference with Israeli Prime Minister Benjamin Netanyahu late Saturday in Jerusalem, Clinton praised Netanyahu's offer to curb some settlement construction, saying it was an unprecedented gesture. "I believe that the U.S. condones continued settlement expansion," Palestinian government spokesman Ghassan Khatib said Sunday in a rare public chiding of Washington. "Calling for a resumption of negotiations despite continued settlement construction doesn't help because we have tried this way many times," Khatib added. "Negotiations are about ending the occupation and settlement expansion is about entrenching the occupation." Palestinians expressed deep disappointment and frustration at Clinton's words, which signaled a softening of the past U.S. call for a complete freeze on settlement activity. Jordan and Egypt also issued statements Sunday critical of the latest U.S. approach to the settlements issue. Clinton spoke by telephone with Egyptian Foreign Minister Ahmed Aboul Gheit. Clinton was in Marrakech to attend a regional conference called Forum for the Future, with representatives of nations of the Middle East and North Africa, as well as advanced industrialized countries. It is the final stop on a weeklong journey that began Wednesday in Pakistan.